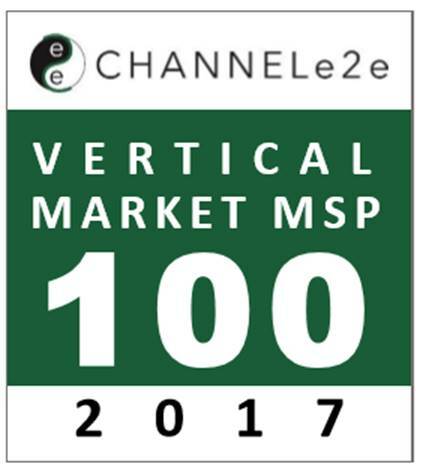 The team of business computer services experts at InfiNet Solutions Inc. is thrilled to announce that they have been named to this year’s Top 100 Vertical Market MSPs list by ChannelE2E. Every year ChannelE2E releases a number of extensively researched lists that rank MSP service providers in a variety of categories, and this year InfiNet is thrilled to have been recognized as a dynamic and strategic IT provider for Omaha businesses. ChannelE2E is committed to tracking the work of strategic IT MSPs throughout their business lifecycle from entrepreneurship to exit. ChannelE2E is passionate about recognizing IT service strategies that work and drive influential change in the marketplace. Through their research, the ChannelE2E team determines the key performance indicators within the industry including business development, talent recruitment, management, financial models, marketing, sales and customer engagement. Using these indicators, ChannelE2E is then able to position industry players in a way that acknowledges and celebrates success while also fostering inspiration and growth through the optimization of business productivity and performance. The Top 100 Vertical Market MSPs list is compiled based on an assessment of Q1 industry results and this year, and InfiNet received a ranking of 76! This is an incredibly valued accomplishment for InfiNet, that truly aligns with their business vision and mission. The InfiNet team is committed to providing forward-thinking IT and reliable IT support for Omaha businesses. Through their ability to provide extensive managed IT services, strategic IT guidance, and innovative consultation, InfiNet has earned themselves a unique and celebrated market position in the managed IT service industry. Michael Johnson, President at InfiNet, is incredibly proud of the entire team for this accomplishment. “At InfiNet, we continually strive to deliver the very best IT support and strategy to every business we work with,” Johnson says. “To be recognized as one of the tops in our field, by a leading industry publication, is an accomplishment that motivates us greatly. Michael Johnson is available for an immediate interview about this exciting accomplishment for InfiNet Solutions Inc.
InfiNet is a strategic and proactive managed IT service provider, serving businesses and community organizations across Nebraska. The InfiNet difference lies in their commitment to developing a meaningful understanding of each client so they can provide proactive technology solutions to drive efficiency, productivity, and scalability for organizations of all kinds. The InfiNet team of professionals is made up of real people who are committed to being active technology partners who are approachable, focused and strategic in all the work they do. For more information about InfiNet please visit www.omahait.com.